Grab the leash, stuff some schmackos in the bag and pull on your cutest matching Gorman puppy ‘n human outfit—Melbourne’s best (and only?!) doggo cinema has reopened for another tail-wagging season. QV Melbourne Outdoor Cinema has extended its program (dubbed Flick Fest) and will run until the end of March. Along with a curated selection of Hollywood hits and cult classics, all screenings will be pup-friendly (because who needs a blanket when there’s a Bernese Mountain Dog?). Doggo dress up nights will return on Friday 9 February and Saturday 10 February, featuring the paw-somest pampered pooches. Free pet photography is offered over two nights, and all proceeds from tickets will go towards The Lost Dogs Home, so there’s never been a better time for a pup date. If you’re still desperately searching for the perfect pupper—put down the ice-cream and leave the couch behind. Dogs without homes from The Lost Dogs Home will join the screening of Red Dog 2 on Friday 9 February, with cinema goers invited to a meet ‘n greet from 7.30pm. Doggo experts (um, where do we apply?!) will provide expert matchmaking tips for the doggy Valentine occasion. Other highlights throughout the season (there are many, so clear your diaries) include Oscar week (think: Get Out, Lion and La La Land), stylish films to hail in Fashion Week (1 March to 4 March), 80s throwback (8 March to 11 March), animation week (15 March to 18 March) and a series of sing-a-long musicals movies (22 March to 25 March). If you’re not already booking your tickets (did we mention they start at $12 a pop? 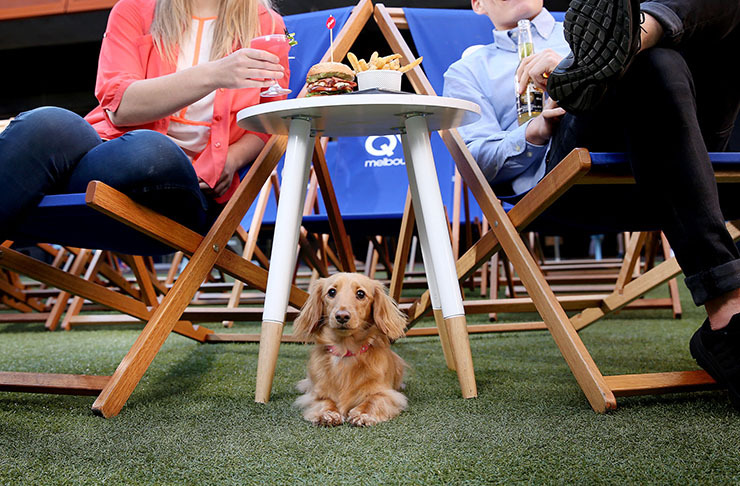 ), every outdoor cinema session at QV Melbourne will feature a themed complimentary cocktails or nibble. Expect pop-up Aperol bars, champagne cocktails, fairyfloss and popcorn depending on the week. No, we don’t know how they’re earning money. Set on the Astroturf Lawn in the heart of QV Square, the silent open-air cinema features deckchair seating and individual headphones for every guest. It’s romantic AF—whether you want to bring your bestie, bae or fur babies. Editor's note: This article is proudly sponsored by QV Melbourne and endorsed by The Urban List. Thank you for supporting the sponsors who make The Urban List possible. Click here for more information on our editorial policy.